Each year 300,000 coronary artery bypass grafting (CABG) operations are performed in the United States, 25% of them in women. Over the past 30 years the patient population undergoing surgery has dramatically changed. In the early 1970s only a few patients (men and women) over the age of 70 years and/or with an ejection fraction less than 50% were felt to be suitable candidates for CABG. With refinements in technology and increasing operator experience the percentage of high-risk patients significantly rose (Weintraub et al. 1998). In other words, presently there is a much higher percentage of patients with reduced left ventricular function, three-vessel coronary artery disease, diabetes mellitus, and over 70 years of age that undergo CABG than 25 years ago. Due to the increasing number of high-risk patients, operative mortality in men rose from 1% in 1974 to 2.7% in 1991 and in women from 1.3 to 5.4%, respectively. 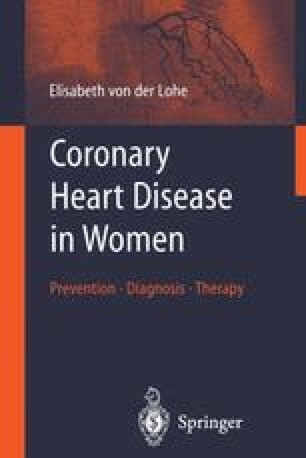 Since coronary artery disease in women generally presents approximately 10–15 years later in life than it does in men women undergoing CABG surgery are significantly older than men. The percentage of men older than 60 years increased from 28.8% in 1974–1979 to 59.6% in 1988–1991. The percentage of women over age 60 years was 45.1% from 1974–1979 and 77.3% from 1988–1991. Only 3.5% of men, but 7.3% of women, were older than 70 years from 1974 to 1979. From 1988 to 1991 it was 24.3 and 38.8%, respectively.